This page has instructions to help you manage project, product and organization risks. View the details of a particular issue. Click the Assess risk button (top right corner). The Risk assessment section will appear. Move the sliders to specify both the impact and probability of the risk. Optionally specify residual risk. Check the Specify residual risk checkbox, then move the relevant sliders. And that's it - you have added risk information to the issue, and it will now appear in relevant risk registers and risk matrices (see "View a risk register and matrix"below). The Assess risk button appears only if risk management is enabled for that project (see "Enable risk register for your projects" below). Click Projects in Jira's main menu, find the relevant project, then click Risk register in the Add-ons menu. A risk register is automatically created for projects in which risk management is enabled. In addition, you can create custom risk registers that collate the risks from a set of projects that you nominate. Visit the Risk registers page. Follow the instructions to give your risk register a name, and select the projects upon which it is based. N.B. Treatment linking must be enabled by a Jira Administrator. See "Enable treatment linking" below. Link a risk to one or more treatment issues, which will then appear on the risk register view. Create an issue to represent a treatment task. Navigate to the details page for the risk. From the context menu (top right), click Link. Specify the 'is treated by' link type. You'll see the 'is treated by' links on the risk's details page. Those same treatment links will appear on the risk register view. If you are using Jira Software, there will be an additional menu item in the issue context menu: Create linked issue. That's a short-cut that lets you create an issue, and link it to the current risk in one step. No matter how you create the link between the risk issue and its treatment issues, be careful to set up the links so that they read 'is treated by' from the risk side, and 'treats' from the treatment side. Under Risk treatment, select the relevant issue link type. Visit the Risk model page. Select risk levels for each probability and impact combination. 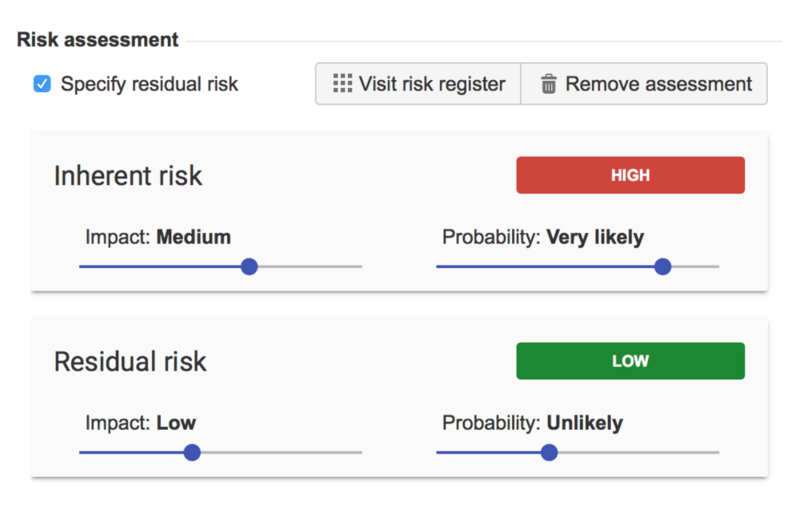 Make other adjustments to the risk model via the tabs at the bottom of the Risk model page. Click Risk register in the left-side menu. Enable Override of the default settings. An issue type for risks has been selected (see below). Select an issue type. If one does not already exist, you will be offered the opportunity to create an issue type called 'Risk'. Indicate your preferences under the Risk matrix appearance heading.